A quartz carpet and marble steps lead to the balcony’s glass, rim-flow pool looking onto the magnificent view of Lion’s Head. Peeking over a curve in the coastal road of Barley Bay, Camps Bay, four crafty apartments lure you into their fold, wrapping you in so much luxury that you may never want to escape their irregular walls. Part of the bewitchment of the Ebb Tide luxury apartments can be blamed on their intoxicating view – a sweeping panorama that leads the eye from the vast Atlantic to the peak of Lion’s Head. Above: The glass balustrade allows uninterrupted views of the Atlantic, while the quartz carpet extends from the balcony into the apartment, blurring the boundary between indoor and outdoor spaces. The chaise longue by Cappellini, called the Shadow, is an inviting piece next to the Zanotta table. the Greek Volakas marble bar; the clever use of glass and minimal wood allows the staircase to ‘float’ in the apartment without disrupting the architecture. 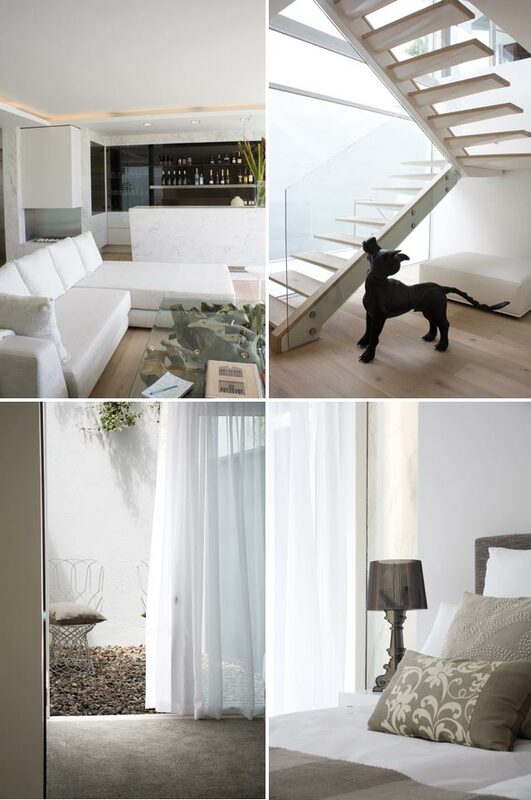 The leather ottoman by Poltrona Frau stands behind the bronze dog sculpture by David Brown that welcomes guests at the front door; modern Perspex lamps and old-school candlewick cushions combine in this guest room toadd interest; a pebbled courtyard offers an outdoor area for relaxation, with designer chairs by Emu. Besides the private-lift access, miniconcierge service and designer kitchen replete with magnetic drawers and fully integrated Miele appliances, each apartment functions on the Dynalite Smart Home system. Preset scenes allow one touch of a button to create a mood to suit any occasion – including light intensity, open or closed blinds and a chosen music output. Left: The master bedroom is graced by a striking blue bird chaise by Cappellini, adding an accent colour to the neutral palette while livening up the space. 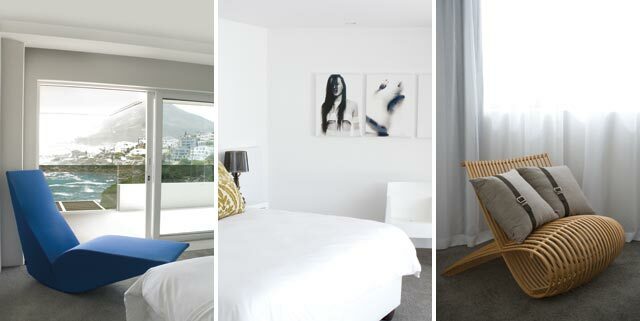 Center: This nearly all-white bedroom is decorated with a series of photographs by Damon Fourie printed on canvas. The funky Toy chairs below it are by Philippe Starck for Driade. Right: This Cappellini design is called the Wooden Chair by Marc Newson, and adds a certain quirkiness to one of the guest bedrooms. putting on his creative building hat. Every bedroom has its own private balcony. One of these clever spaces is a pebbled courtyard, which Greg created as an alternative to a high-maintenance garden – the creepers planted to grow down the steel cables are intended to offer the ‘garden’ feel. It’s all about the element of surprise and discovery,’ he says. bedroom. While adding interest to this modern bathroom, it also creates a unique identity to the room.The open-plan dining room leads on from the lounge. Right: The 250kg Pierre Cronje table is filled with light streaming through the architecturally structured glass walls. The chandelier hanging above the staircase is a classic by Gino Sarfotti for Flos Lighting, dating back to the art-deco period when it was originally designed. It is available from Province Lighting. Jacques’ interiors are just as intriguing. Passionate about true design and firmly standing against the many knock-offs flooding the local market, the Site team custom-designed some furniture pieces and sourced others from world-renowned designer brands such as Cappellini, Zanotta and Cassina. ‘These are not just functional – they’re collectibles,’ says Jacques of the many investment pieces decorating the neutral palette, with a different designer chair adding an individual identity and touch of drama to each room. A glass-rim pool is a welcome addition to each apartment, where glass sliding doors open up completely to allow this water feature to become part of the interiors. The quartz carpet on each balcony continues into the apartment for a few centimetres before breaking into the bleached, white-oak flooring. Greg explains: ‘The idea is to create a continuation between the inside and outside space by blurring the boundary where the doorline normally defines what’s insid and out.’ No matter whether or not lines are blurred, the space constantly impresses through its clever use of corners and other usually ignored spaces, dressed in some of the world’s most iconic and timeless furniture pieces. ‘It was only natural for an architectural jewel like Ebb Tide to be dressed in the best,’ says Jacques. But then, what’s the point of dressing up if you never want to leave? • Select the finish and fabric of your bigger furniture pieces to blend in as close as possible with the finishes used on areas such as the floors and walls. • Play with accent colours in accessories and objets d’art. It is much easier and more cost-effective to change a scatter cushion than to replace a sofa. • Less is more. Do away with clutter. When you have a neutral palette and only the necessities to create your own calming oasis, you are able to focus on the real things that matter: love, peace and happiness.